Back in the days when the average desktop PC was barely capable of running anything more demanding than a word processor, overclocking your CPU to get £1,000 performance from a £300 chip was almost as big a necessity as switching off the 'turbo' button to underclock and run non speed-limited software. The world has changed. A modern multi-core CPU has a much longer shelf life than its ancestors, since performance today is as much a factor of the number of cores and microcode as it is raw clockspeed. An Intel Q6600 bought four years ago is unlikely to feel sluggish whatever the situation, and upgrading isn't expensive anyway. For the reasonable outlay of £150, you can pick up anything from the latest Sandy Bridge chips through to an excessively powerful sixcore processor from AMD. The basics, though, remain the same: why buy a new chip when you can save money by overclocking the one you have? The techniques used in CPU overclocking are largely unchanged since those early days: simply ask your processor's clock to run a little faster, do something to take care of the extra heat produced, and you're done. It's true that most CPU architectures have a cap beyond which they simply won't perform, but the good news is that up to 5GHz is possible for new Intel processors, and you won't need any flashy coolants to make it happen. We'll talk a lot about clocks in this article, so here's a definition. Your CPU's clock speed is calculated by taking the base clock (a signal supplied by the clock generator on the motherboard) and then applying a multiplier. On newer motherboards, the base clock will be 133MHz by default, whereas for Core 2 or older CPUs, the base clock varies between 100MHz and 166MHz. The important thing to remember is that the CPU speed is always defined by this external influence from the motherboard. It doesn't just run; it needs to be told how. Sometimes this is easy. If you own an Extreme Edition chip, one of the new K-series models, or any unlocked Intel CPU, then you'll be able to select the multiplier. So a Core i7 980X running at 3.33GHz (133MHz base clock, x25 multiplier) can be overclocked to 4GHz just by increasing the multiplier to 30. If you don't have an unlocked chip the multiplier will be fixed at a set value or, in the case of the Core i7 and i5 CPUs we've seen, you'll be given a restricted set of options in the BIOS to set the multiplier or apply a very small overclock. If you can't increase the multiplier, you'll need to increase the base clock itself, and that's where your choice of motherboard is all-important - better boards give you more options. A warning though: the base clock affects the other buses in your machine. This includes the PCI-e bus used by your graphics card, so either your GPU needs to be well cooled, or you'll need to be able to 'decouple' the CPU and GPU in the BIOS and leave your graphics card running at stock speed. The other stalwart of overclocking is the CPU voltage setting - as you increase the processor speed, it's necessary to increase the voltage supplied to the processor in order to retain stability. This isn't a blunt instrument - increase the voltage too much and you'll actually introduce more instability. Increased voltage also leads to greatly increased core temperatures, as we'll see later on. Are you thinking of building a system just for overclocking? We used an MSI P55-GD65 for our Intel-based tests. This is a solid board that costs less than £100 yet still offers a wide range of all-important BIOS settings. In case you aren't confident with fiddling around too deeply in the BIOS, it also has broad options that increase clockspeeds across the board, and can automatically find a modest but stable overclock. As far as the chip goes, any one of Intel's Core 2, Core i5 or Core i7 processors is a great place to start. We think the best choice right now is the Core i5 2500K, a 3.33GHz chip that will hit 4GHz reasonably easily. That processor leaves you a little scuppered when it comes to motherboards though - the Z68 chipset is yet to mature, so we're still looking for the perfect partner for this chip. Instead, for the walkthrough below, we used an Intel Core i7 870 Quad Core Processor to show you how to get the most from an Intel-based system. The chip itself is pricey, but the socket-1156 motherboards are cheap enough, and you can decouple the memory timings while finding the fastest stable speed for your processor, which is very handy. Remember, for stability, you need to balance the base clock, multiplier, and the voltage supplied to the CPU and the Quickpath Interconnect system interface. This is a strange, unpredictable science. Every chip is different; a high base clock with a low multiplier may work better than a low base clock and a high multiplier, or vice versa. Now we'll take a look at the other side of the equation. AMD may not hold the performance crown, but there's no doubt its chips still offer great value for money, and a great deal of flexibility too. Thanks to its high-end overclocking features, the Black Edition family more than makes up for any performance shortfall. Retailing from as little as £88, the quad-core Phenom II X4 955 is one of the best quad-core chips on the market, and ships with its multiplier unlocked. We're going to overclock this chip to see how far we can push it, but the same process will work for any AMD processor. You'll need a solid cooler and motherboard, and a good selection of settings to play with. We're using the Titan Fenrir EVO cooler, as it's a perfect example of a higher-end air cooler. To back this up, we have the incredible Asus Crosshair IV Formula motherboard: an overclocking-focused mainboard with every setting you could want. In the bad old days you'd need to fiddle with motherboard jumpers. Not any more. BIOS settings remain a core technique, but they're getting outdated. Windows-based utilities on motherboards like the Crosshair offer as much flexibility, and they're much more convenient. The first important step here is to reduce the memory bus speed to the lowest setting - ideally 400MHz with basic latencies of 8-8-8-8-24. These will help eliminate memory-based errors, so you can be more certain that the processor has caused a lockup by throwing a wobbly. Then it's time to turn things up a little. Increasing the base clock by 10MHz at a time is safe, but also incredibly boring. We prefer jumping in with both feet and assuming a free 10 per cent increase is a safe bet. 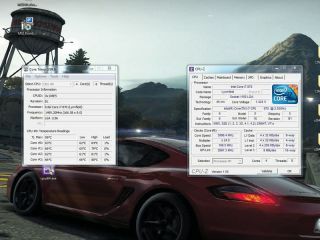 With the 3.2GHz Phenom II 955, that means an initial overclock to 3.5GHz or a Front Side Bus speed of 219GHz. This worked fine, so we started pushing a little harder. Eventually we hit 3,728MHz with the FSB at 233MHz before the Cinebench X264 benchmark fell over, though Windows itself remained stable. We cranked the FSB back down, and eventually settled on 228MHz and 3,648MHz as being stable. Of course, the Black Edition has its multiplier unlocked. This enables increases in the CPU speed without altering the system bus from its stock speed, which is better for everyone. We returned to the unstable level of 3,700MHz, using a 200MHz FSB and a multiplier of 18.5x and increased the voltage by a single step from the stock 1.350v until the system was stable again. Then we returned to slowly increasing processor speed via the FSB until it became unstable again. In the end, we managed to achieve a maximum stable overclock of 3,904MHz with a 1.56v core voltage. That's a 205MHz FSB, 19x multiplier and a worryingly elevated core temperature of 60.5°C! We did find this a little unstable though, so we went back a couple of steps to our best solid results: 3,838MHz with a 19x multiplier and a 202MHz FSB.